The Las Palmeras Apartments Complex is situated in the upper part of S Algar next to the Nature Area of Rafalet. Hotel very clean and tidy, staff very polite but very busy and on a mission. Beds are very hard and uncomfortable mosquito's a pain in the backside biting you mainly at evening and night time with lovely big bites on your body. Policy had changed as regards to eating at san luis, you can no longer do that,unless at extra cost at around 15 euros a head! Food at las palmeras was very tedious, daily. Food was very dry at times with no juice, gravy etc. Even though we were all inclusive my son was told on several occasions that they did not have any lollies he wanted, when they did??!! Sunbeds on the main pool were very uncomfortable unless you sat at the baby pool on the green beds. On the good side staff work very hard indeed. food; on the only occasion we ate at Las Palmeras none of us enjoyed or indeed finished our meals, however we rarely like hotel/apartment food anywhere. We loved the location, its quiet and quite reserved, the only problem with S'Algar is the abundant animal(i hope) excrement. Staff are normal, they're decent people trying their best. I would visit Las Palmeras again without doubt. We stayed at the Las Palmeras apartments. I have been before a few years ago and it hasn't changed. It's still as lovely as I remember. still very clean and well maintained, and friendly staff. When we arrived the first few days were quiet around the pool but we found that better it felt more relaxing without the noise. There were days were we had the pool to ourselves which was great. It did eventually pick up with more families arriving but that didnt bother us. We had a fantastic view from our apartment looking out to the sea, we spent plenty of times sat on the balcony watching boats! We have been holidaying in Menorca since 1989 and stayed in S'Algar seven times, at Las Palmeras three times. On this occasion we did not get the apartment we had requested but within 24 hrs of arriving we were moved and the staff were brilliant. The pool is great and this year there were plenty of sun beds available. The food in the restaurant is superb every time and we have always found the staff friendly and the service excellent. Will we go again - maybe not as our family is older now and we want different experiences but we think that the accommodation gives value for money. Spent the worst holiday ever in this accommodation, no entertainmen, in the middle of nowhere. Nothing good to say about it unfortunately!! Spent 2 miserable days there before transfering........never again. Our fourth visit to Las Palmeras most people have visited numerous times some into double figures. As always place was immaculate we had two bungalows next door to one another by the main pool after e-mail requesting them a month before travelling. Food is very good but staff could be a little more cheerful in bar and restaurant and menu very limited on all inclusive you get a different menu to self catering guests, ate at San Luis a few time which this year you have to book the day before which is a little inconvienient. One down side this year was the shop, it is only a quarter of the size no fresh bread etc certainly not enough for people on self catering could not even buy water and its a long walk in the heat to supermarkets on the front. Ate one night at isabelas in the centre at front of resort and was ripped off very dissapointing meal and then charged for fillet steak has ordered grilled steak from snack menu should have been charged 9 euros was charged 18 as was given fillet steak and they would not back down which I was disgusted about as we have eaten their for last four years so beware. The resort itself was not as clean as usual and the Pirates restaurant was closed and up for sale as were a lot of the apartments in this area no sure what was going on wonder if being redeveloped? We love s'algar and have very upset kids as we are going to the opposite side of the Island next summer for a change but am sure we will be back, there is something about the place. My family and I stayed at the Las Palmeras apartments. We wanted a quiet holiday and on paper this seem to deliver what we wanted, however we never got the quiet holiday we wanted. The locals used the pool in the afternoons and at weekends, making it rowdy and the pool area became very busy and this was in June so i can only imagine it may get worse in the high season. The Hotel was clean and the views were great it was a shame that the Hotel did not adhere to their own rules which are given to every guest on arrival, these rules were not implemented by hotel management.The maids were friendly and our room was kept clean and towels replaced when needed. This could be a great place to enjoy a restful break if only the management made sure the rules were adhered to by all parties. 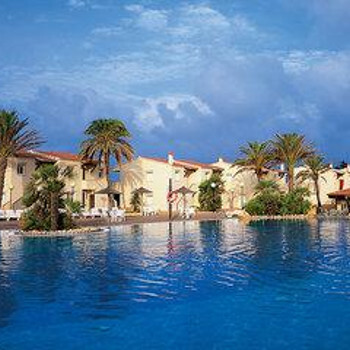 Should make it clear that we stay in a friend's villa just next to this hotel but have always used the facilities at Las Palmeras and often eat in their restaurant and seeing as it has not had a review for a while I thought I would plug it a little bit. Basically the facilities are very clean both the adult and kids pools are great. There is a nice play area for children and a very adequate shop with all that you would normally need for self catering. Restaurant has a good choice of food. No entertainment is provided - the Hotel San Luis in s'algar is the place to go for that. You must have a car if you go to s'algar I believe in order to get the best of Menorca - this place makes a great base and would be highly recommended. If our friend did not have a villa we would not hesitate to stay in these apartments as an alternative base in Menorca. Hotel appeared to be very clean and well maintained. Plenty of maintenance staff visible. Location is quite isolated although resort is very quite too. Little entertainment, ie singers holiday makers not included in entertainment - no childrens entertainmnet day or night. Pool appeared clean although the hotel do not have a policy where babies must wear nappies. Children urinated and defecated in pool during our visit. Both my children were ill with one being hospitalsed with gastro-entritis for two days !! other one got ear infection in both ears !!! Little to add really, except to agree that this place is very good, and very quiet. If you live in the South of England we recommend that you try Palmair (Bath Travel) flying from Bournemouth - brilliant! The restaurant on site is excellent; the shop, as to be expected, a little pricey but then there's not going to be very much you need. Our room was indeed very clean, though I didn't notice any sign of an 'upgrade for 2004,' but then we don't know what it was like before. The little train is 'Out of Order' apparently, but it is only a pleasant short walk to the village centre (not that there is much there). Although there is effectively no beach in S'Algar, there is a tiny cove with a sandy beach about 25mins easy walk - pass along the front of the Hotel S'Algar pool complex climb a stile (steps in a wall) onto a stoney path and you come to the tiny village of Alcaufar. Walk the length of the main street (as though heading inland) past the Hotel Xuroy then swing round the back of the hotel down a path to the beach. There's a bar there for a sundowner!